Thursday was my last day in the UAE and, aside from visiting Sharif’s exhibition I spent the morning and afternoon wandering through town with a colleague. 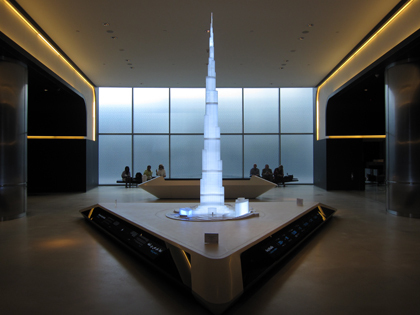 We first took an Art Dubai architectural tour of Burj Khalifa. This is the tallest building in the world, the tour leader said to us, 828 meters to be exact. To clear up any doubt about what that meant, he explained that the Burj Khalifa measured the sum heights of New York’s iconic Empire State and Chrysler Building. Here are city views from Dubai, taken from that building’s observation deck in the 124th floor, as well as images of the largest aquarium in the world, which is sited in the same building complex. The burj (tower) is part of a new and innovative Dubai, and as big as it is it wasn’t enough for our wandering. We decided to look for the historical side of town. A day before, we had seen in the biennial Kamran Shirdel’s Pearls of the Persian Gulf: Dubai 1975, and didn’t want to leave Dubai without exploring some of the locations in that documentary film. After a taxi ride of some 20 minutes in a billboard-less freeway, we were suddenly set in another Dubai. Our hotel, we realized, was probably a steroidal Las Vegas version of the old town, with all the older building’s original proportions, wind towers and alleys for souks (markets). Indeed, the architecture and urban plan of this part of the city changed from vertical to horizontal. It was a flatterer and simpler, yet seemingly busier and livelier city, at least publicly so. Locals walking everywhere, or gathered in spontaneous meetings in the street or spending time outside their shops, or gathering in corners. Finally, I felt foreign. Not even twenty percent of Dubai’s population is Emirati.